The Facebook page, Hidden Truth PH, acted as a platform that David H. Harwell, PhD, used to reach the hearts of every Filipino, most especially the Overseas Filipino Workers (OFW) through his open letter. Harwell first introduces himself as an Overseas American Worker as an opening joke but he is by definition an expatriate worker who teaches. A worker whose job offers a lot of traveling without his own family, an experience as described by Harwell as fun at first but eventually really tiring. The line that Harwell stated as he believes that the Filipinos are more than just the hard working individuals, that they are more than the materialistic people of his own mother land, that the Filipinos are a people who would go through the geographical, emotional, and physical struggle to give their families a better life. “I am American and hard-headed. I am a teacher, but it takes me a long time to learn some things. But I’ve been trying, and your culture has been patient in trying to teach me,” Harwell humbly admitted. He is both amazed and sad at how the OFWs can work so hard despite being maltreated, still find ways to make sure that their families back in the Philippines know that they are doing fine. They work so hard despite being underpaid, just to send money back to their families. And if there is one truth that Harwell has learned, it is that every OFW misses their family so much. Harwell then proceeded to explain that Americans are materialistic, worrying too much on getting nice and fancy items for publicities or to add to their collection. Yet the flaw of the race is that every purchase that they accumulate also accumulates to the lifelong debt that they have to pay. “America’s economy is based on debt,” Harwell pointed out. 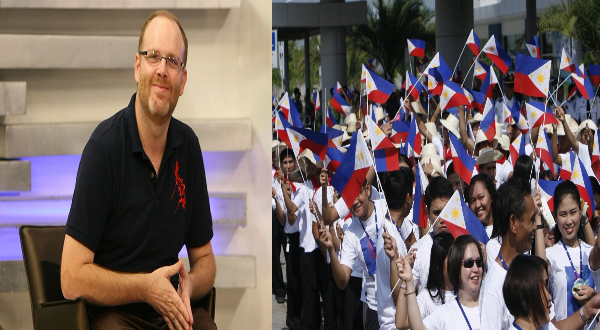 Contrasting Filipinos who worry about having enough to eat and the Americans who worry about new cars, Harwell made a huge point, that he and his people should be the student to the lessons that the Filipino people are teaching them, that life is more than just riches, it is about surviving. Lastly, Harwell comes clean with the benefits that he gets that he admittedly states that he doesn’t deserve. He is thankful though for the care that the Filipinos bestow upon people around them. I am writing to thank Filipinos for the way you have treated me here, and to pass on a lesson I learned from observing the differences between your culture and mine over the years. I am an expatriate worker. I refer to myself as an OAW, an overseas American worker, as a bad joke. The work I do involves a lot of traveling and changing locations, and I do it alone, without family. I have been in 21 countries now, not including my own. It was fun at first. Now, many years later, I am getting tired. The Philippines remains my favorite country of all, though, and I’d like to tell you why before I have to go away again. I have lived for short periods here, traveled here, and have family and friends here. My own family of origin in the United States is like that of many Americans—not much of a family. Americans do not stay very close to their families, geographically or emotionally, and that is a major mistake. I have long been looking for a home and a family, and the Philippines is the only place I have lived where people honestly seem to understand how important their families are. I am American and hard-headed. I am a teacher, but it takes me a long time to learn some things. But I’ve been trying, and your culture has been patient in trying to teach me. In the countries where I’ve lived and worked, all over the Middle East and Asia, it is Filipinos who do all the work and make everything happen. When I am working in a new company abroad, I seek out the Filipino staff when I need help getting something done, and done right. Your international reputation as employees is that you work hard, don’t complain, and are very capable. If all the Filipinos were to go home from the Middle East, the world would stop. Oil is the lifeblood of the world, but without Filipinos, the oil will not come from the ground, it will not be loaded onto the ships, and the ships will not sail. The offices that make the deals and collect the payments will not even open in the morning. The schools will not have teachers, and, of course, the hospitals will have no staff. What I have seen, that many of you have not seen, is how your family members, the ones who are overseas Filipino workers, do not tell you much about how hard their lives actually are. OFWs are very often mistreated in other countries, at work and in their personal lives. You probably have not heard much about how they do all the work but are severely underpaid, because they know that the money they are earning must be sent home to you, who depend on them. The OFWs are very strong people, perhaps the strongest I have ever seen. They have their pictures taken in front of nice shops and locations to post on Facebook so that you won’t worry about them. But every Pinoy I have ever met abroad misses his/her family very, very much. I often pity those of you who go to America. You see pictures of their houses and cars, but not what it took to get those things. We have nice things, too many things, in America, but we take on an incredible debt to get them, and the debt is lifelong. America’s economy is based on debt. Very rarely is a house, car, nice piece of clothing, electronic appliance, and often even food, paid for. We get them with credit, and this debt will take all of our lifetime to pay. That burden is true for anyone in America—the OFWs, those who are married to Americans, and the Americans themselves. Most of us allow the American Dream to become the American Trap. Some of you who go there make it back home, but you give up most of your lives before you do. Some of you who go there learn the very bad American habits of wanting too many things in your hands, and the result is that you live only to work, instead of working only to live. The things we own actually own us. That is the great mistake we Americans make in our lives. We live only to work, and we work only to buy more things that we don’t need. We lose our lives in the process. I have sometimes tried to explain it like this: In America, our hands are full, but our hearts are empty. You have many problems here, I understand that. Americans worry about having new cars, Filipinos worry about having enough food to eat. That’s an enormous difference. But do not envy us, because we should learn something from you. What I see is that even when your hands are empty, your hearts remain full. I have many privileges in the countries where I work, because I am an expat. I do not deserve these things, but I have them. However, in every country I visit, I see that you are there also, taking care of your families, friends, bosses, and coworkers first, and yourselves last. And you have always taken care of me, in this country and in every other place where I have been. These are places where I have been very alone, very tired, very hungry, and very worried, but there have always been Filipinos in my offices, in the shops, in the restaurants, in the hospitals, everywhere, who smile at and take good care of me. I always try to let you know that I have lived and traveled in the Philippines and how much I like your country. I know that behind those smiles of yours, here and abroad, are many worries and problems. Please know that at least one of us expats has seen what you do for others and understands that you have a story behind your smiles. Know that at least one of us admires you, respects you, and thanks you for your sacrifices. Salamat po. Ingat lagi. Mahal ko kayong lahat.